Headed out at 7:30 this morning to a church rummage sale (always the BEST sales!) over in McLean. I hopped in line behind about 10 people and by the time the sale started at 8:00 the line had about 50 people. The lady in charge told us that the money was going to build houses in Guatemala for widows and their children. Then she promptly opened the doors and we herded inside down the longest corridor before reaching a large room with tables piled high and deep with lots of used booty! Outside of the sale was a nice assortment of furninture, bikes, and exercise machines. I saw this painted cart from Costa Rica and just had to snap a picture to show you the details! This was for sale for $10, and as cute as it is, I just don't have space for it. I also saw this sweet little faded red trike cozied up to a big boy bike. This is one of my favorite purchases at the church sale. I love it when I find things to use in my crafts! Aren't these trims cute? I KNOW I'll find lots of uses for them on totes and pin cushions and MORE! I drove around the corner to the McLean American Legion post which advertised a "rain or shine" yard sale. The sale was in the Am. Legion hall and out in the parking lot with several vendors. And here are the vendors outside. The air was growing increasingly humid but they all seemed very happy under their umbrellas and with their coolers full of icy beverages. The Foreign Legion gentleman were happy to have them there and even brought out folding chairs for the vendors to use. 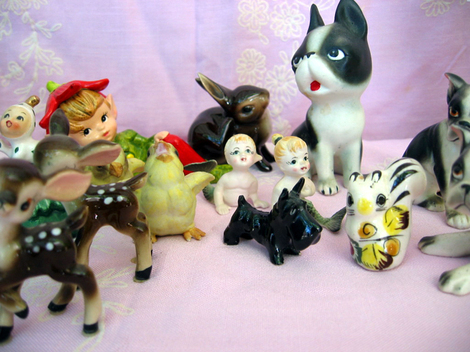 I just love these sweet vintage wooden figures in their soft and cherry colors! I will probably use them on wreaths--I'm thinking of using the pink and aqua angels for a Christmas corsage wreath. What do you think? Also I got this wonderful vintage concrete Cardinal, and I think he looks content in my garden. I love his painted bullseye. Speaking of cool garden ornaments, my friend Debbie, owner of Bayberry Cove, came over on friday bearing delish Subway subs and icy Diet Cokes! We sat on the deck and enjoyed a lovely lunch, which was topped off with some fabulous Ben & Jerry's Cake Batter ice cream and chocolate cake . Then Debbie gave me this awesome concrete gnome for my birthday (which was a week ago but we were out of town)!!! Don't you love his silly expression. I think he looks like a Bob, so that's his name! This is a stretch of beach along the river bordered not by cottages but by trees and farmland. Our doggie is so happy to be out there! This pre-Civil War house is called Shalango. I took this picture a few steps up from the beach. The house is surrounded mostly by soybean fields. A wild rose bush grows on the beach. Arent't these lovely? To test out how close you can get with the macro lens feature of the camera. hubby got down very low on the beach to capture this ladybug getting ready to fly off of a pinecone on the beach. I tested the zoom feature on this crabber who was about 20 yards offshore hauling in the first bluecrabs of the season. The sailboat way in the background is one of several that weighed anchor in the river that evening so the occupants could sleep. The river is just off the Chesapeake Bay and we get a lot of sailboats. 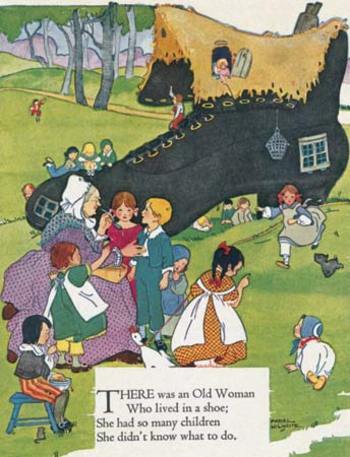 This is one of my favorite cottages which is three doors down from our place. It was one of the first ones built on the point, in about the 1940's. The concrete steps lead down to the beach. The wild blackberries are in bloom. In a month we'll be fighting the poison ivy to pick these succulent berries! Over on the creek side of the peninsula near the public boat landing, is this huge pile of oyster shells. These are often hauled off to be put in the river or creek in oyster beds where baby oysters will grow after seeding. In the woods, the laurel is in full bloom! As are the morning glories amongst the beach sweet grass! Doggie Sheila found a big stick to carry! ...an antique show! Less than 50 dealers were present to sell some very high end wares like silver and Majolica. I found two cute vintage planters for a very good price but that was all. Later we found a small flea market which yielded some wonderful kitschy bargains! I did enjoy the view here though and the weather was gorgeous despite the fact that I had to pay $7 to get in. I grabbed some fresh sweet potato fries and a Diet Coke before leaving the antique show. This morning I woke up another year older, but feeling as good as I ever had in my life. I have many blessings. On my birthday I count them all! I am the same age as my favorite Mr. Darcy: Colin Firth. I was born the year Sweet n' Low was first put on the market. I was nine when Neil Armstrong first set foot on the moon. Bono is 13 days older than me. I was born the same year John F. Kennedy, Jr. was born, which was the same year John F. Kennedy was elected President of The United States. Isn't this Canon camera wonderful? I am planning on learning how to use all of it's functions (hopefully) by the end of the weekend! We're heading out later today to the beach house! A great place to practice using my fab new Camera--Oh, it's a Canon S5 IS Powershot. I love it! I just love his aqua eyes and red and white "fur." I put an aqua bow around his neck, and he now stands guard in my studio. A bargain for 25 cents! 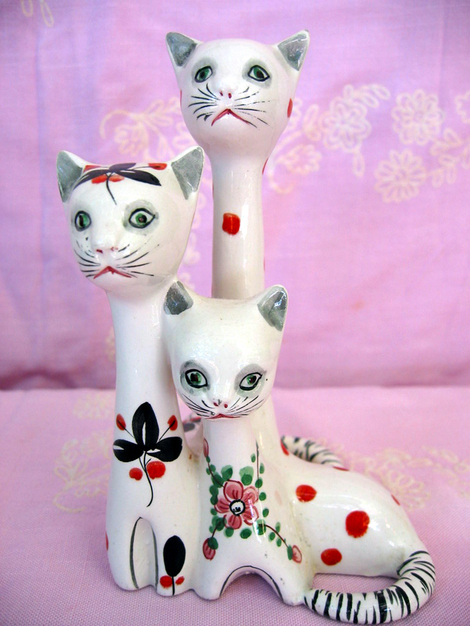 This trio of kitties from Italy will make a neat larger sized pin cushion! I love the red dots! After burning up too much gas for nothing much else, I decided to head home to a sale advertsied as starting at nine. The ad was in the "Moving Sales" section and said "entire house contents." Sounded like an estate sale to me, and the house was a few blocks from my house. There were a few signs pointing the way and the signs read "estate sale." I parked and noticed about a half-dozen people milling around the yard. It was ten minutes to nine and I guessed I was to wait in line with these folks, BUT the people in the yard were the family and they were hosting the sale. They said I could go right on in. I quickly realized I was the only one shopping at the sale so far. And the house was full of great stuff! I had the place to myself! I thought I had died and gone to Heaven! This was the first thing I picked up. 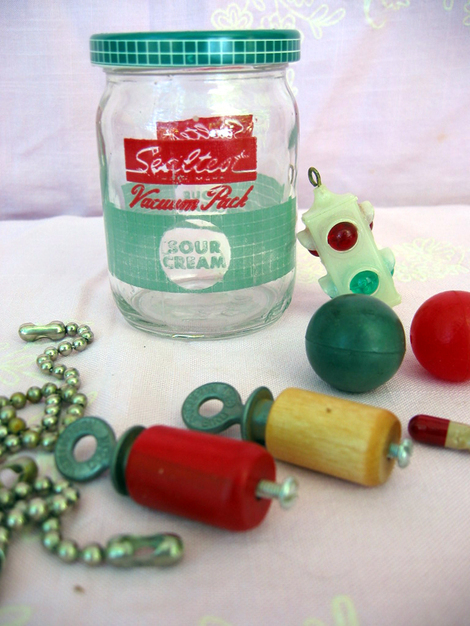 This old Sealtest Sour Cream jar has great graphics and it had all of these cool things inside--two bird calls, bouncy balls, a ball chain, and stoplight thingy. The whole jar and contents was 25 cents! Hubby always teases me about the yard sale "crap" I get. Well, here is some of the real thing! 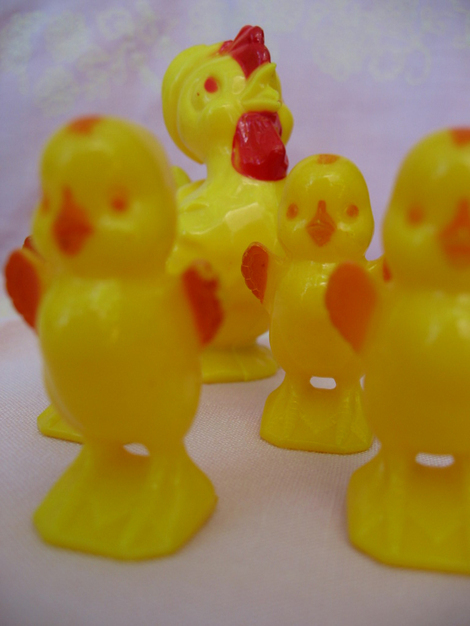 This bag of vintage plastic Easter chicks was fifty cents! 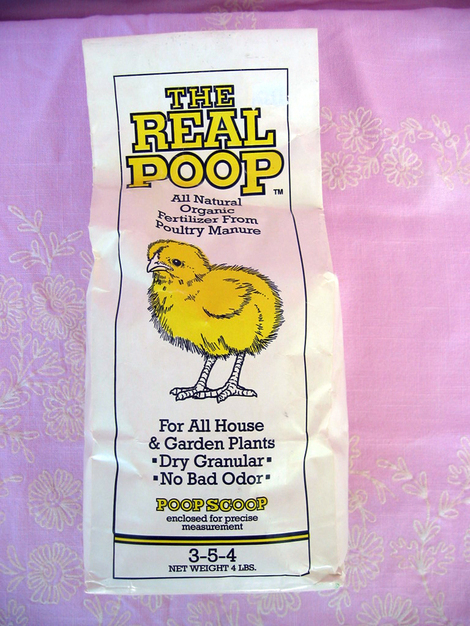 No poop though! 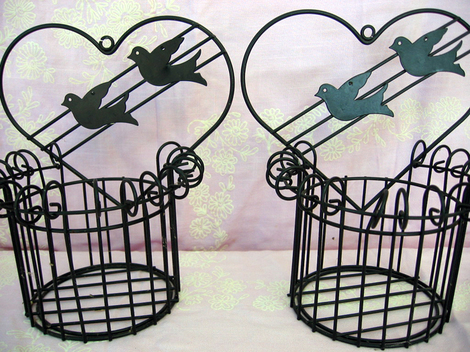 I just LOVE these bird wall-planters! So cute! 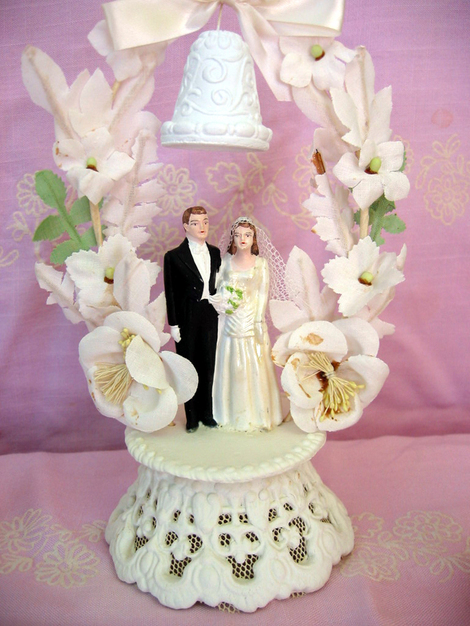 Isn't this cake topper wonderful? It's from the 1940's. I may put this on Ebay. 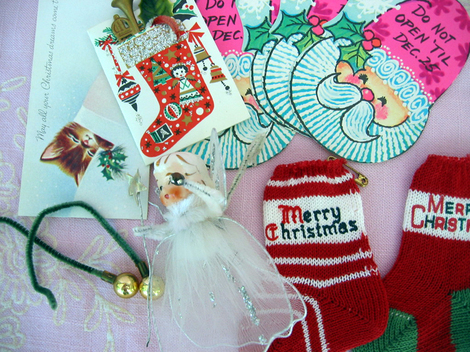 I found a few vintage Christmad doodads to use in crafting. I really like the little angel. Usually these have spun cotton heads, but this one has a pretty ceramic head. 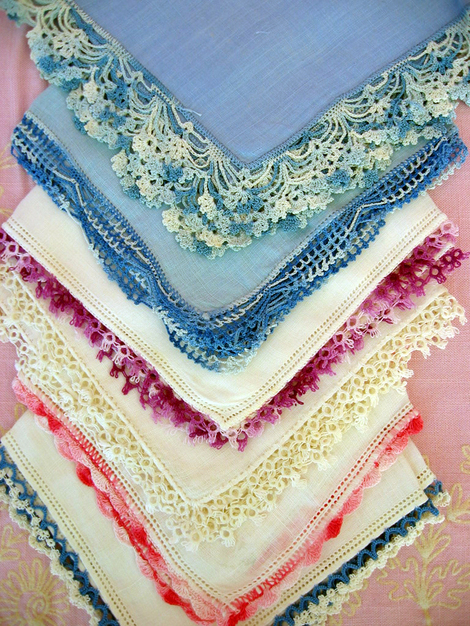 All of these pretty hankies were in a bag for a dollar for the whole bag! Love the trims! 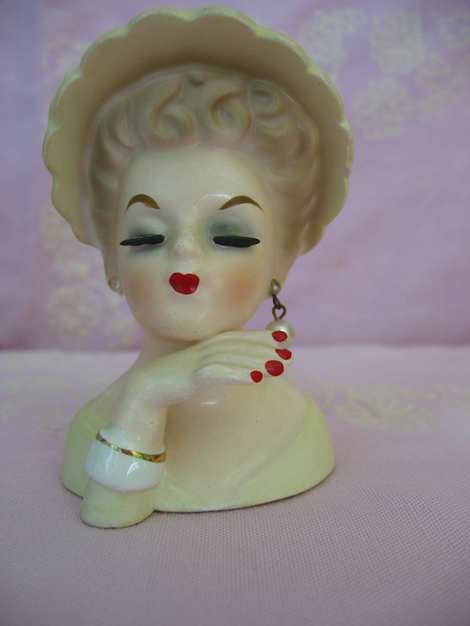 Even though she is missing one earring, this head vase by INARCO from 1963 is so pretty! She's a petite 3 inches tall. I think I'll use her on a pin cushion since she is missing an earring, and collectors of these won't come after me--at least I hope they won't mind me altering her just a bit. I think she would make a lovely pin cushion. I got her for pennies! I spent an hour at the gem and jewelry show. I think I was one of a very small number of attendees who weren't there looking for jewelry. I went straight to the bead area where rainbows of beads were laid out on table after table! I went straight for my favorite colors. After an hour I had a bag full of candy color gooodness! I adore the milk glass blue stars! And the yellow faces are too cute! I couldn't resist the flower and fish cloisonne beads. 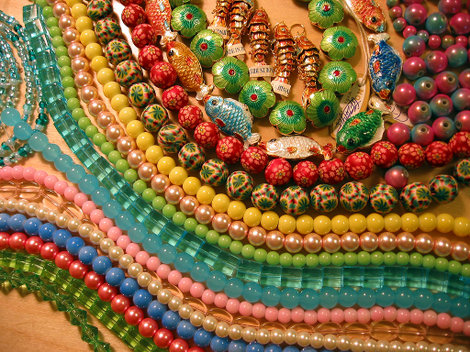 The colorful patterened beads are clay beads. They feel so smooth and warm to the touch! 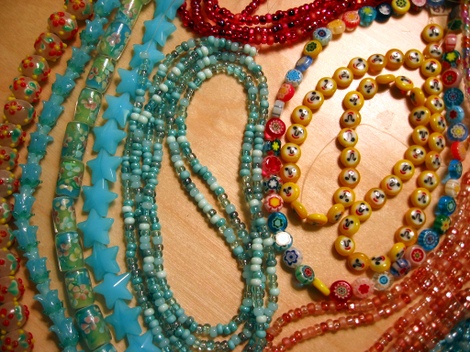 Can't wait to get started and use my beads on some new creations! 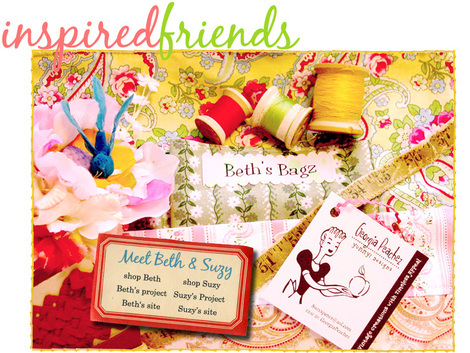 It has been so exiting starting the second half of May as one of the delightful Amy's InspiredFriends with my BFF Suzy! I hope you've had a chance to stop over at InspireCo to see what goodies Amy has posted for the second half of May! The lovely and just too sweet for her own good Amy at Inspire Co. chose my BFF Suzy and me for her Inspired Friends for the second half of May! How cool is that!? 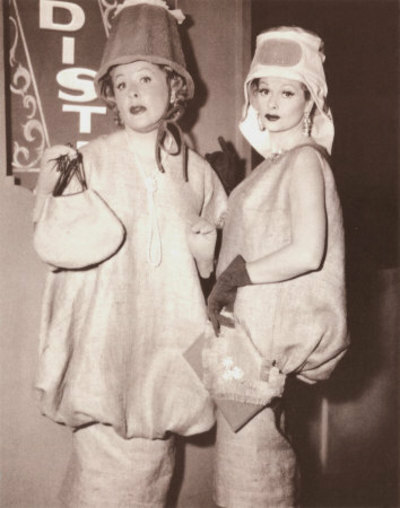 Take a stroll over to InspireCo this afternoon (and for the rest of May) to see a fun Bio (you'll see how Lucy and Ethel relate to us), two craft projects (one from me, one from Suzy), and lots of one-of-a-kind goodies for sale! A big THANK YOU to Amy for making us her Inspired Friends together! 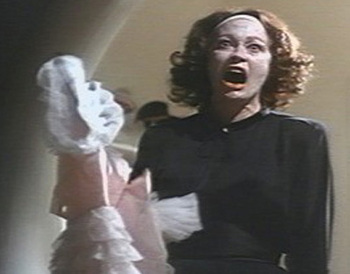 Being with my family is my favorite thing to do on Mother's Day. It doesn't really matter where we are, as long as we're together. During the week there are too many opportunities to keep us apart and doing our own thing: school, work, homework, maintaining my business...the list goes on and on. Sunday morning found us at the International House of Pancakes, you know, IHOP. I love their Butter Pecan syrup. I'd pour it on everything if it was socially acceptable! 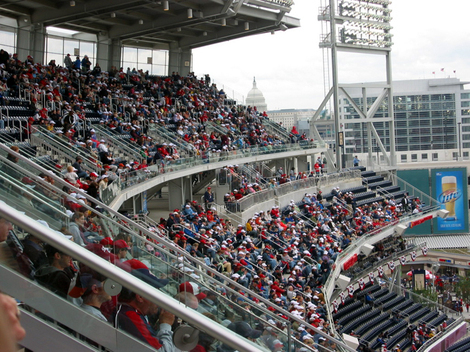 Do you know where this brand new stadium is located? Take a look at the upper center of the picture. Oh, yeah! 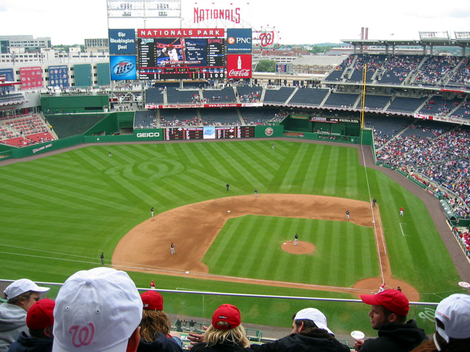 The Washington Nationals made a home run against the Florida Marlins, but they still lost. 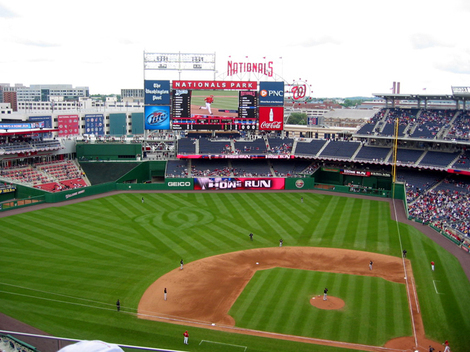 The rain came early and we headed home by the 8th innning. HAPPY MOTHER'S DAY to all blogland mommies out there! 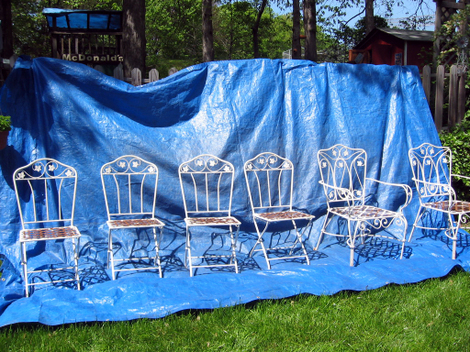 After powerwashing the rush and loose paint from the old chairs, hubby set them on a tarp and we painted them with primer. 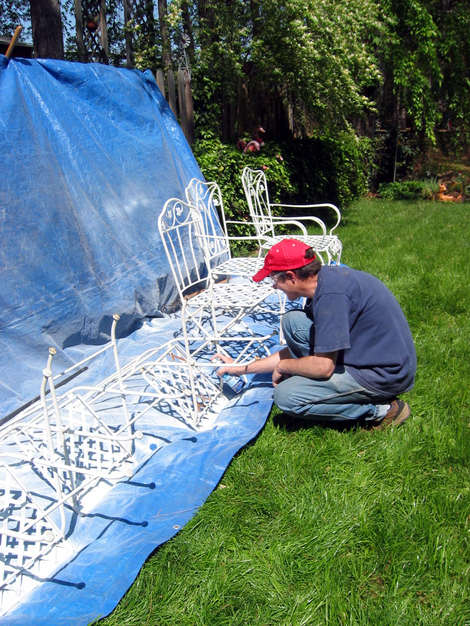 These chairs took three spray paint cans of primer. I decided that the chairs shouldn't be boring white, but it would be fun to paint them three different colors. I wanted pink to be one of them, but hubby put his foot down. 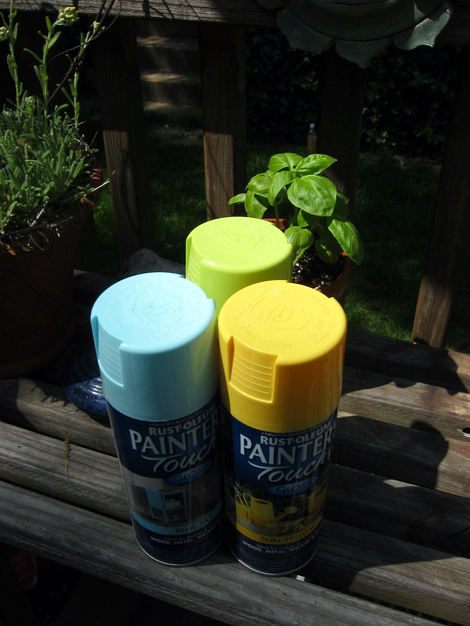 I chose yellow, pale blue, and lime green which is bright and FUN! 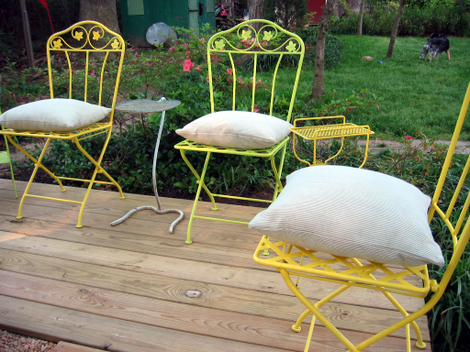 And here are the chairs, all painted, and in position on our fireplace deck. Isn't this a tranquil setting among the shrubs and oak trees? 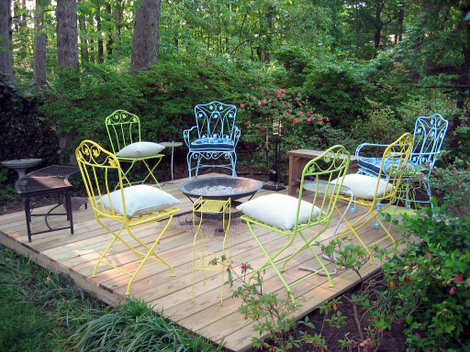 The outdoor fireplace sits on a bed of gravel in the middle of the deck. I bought cushions for the blue arm-chairs at K-Mart from the Martha Stewart collection. 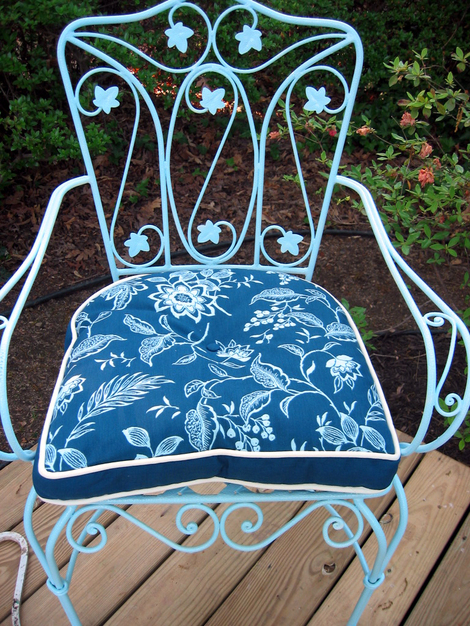 The pale blue matches the chair color perfectly! I found four matching pillows at a local consignment shop. 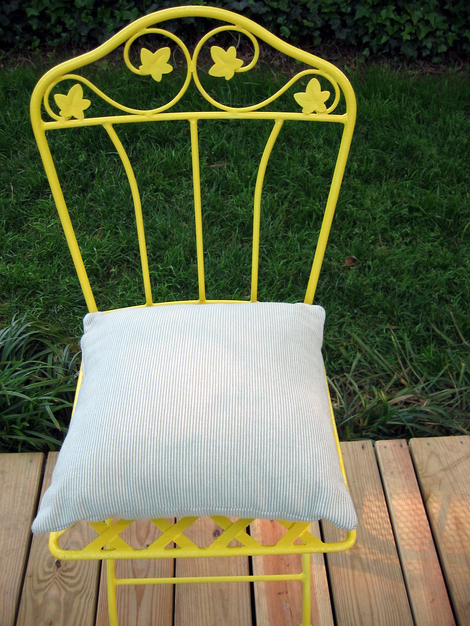 These pillows are the right size for the smaller metal chairs and feel so good to sit on!